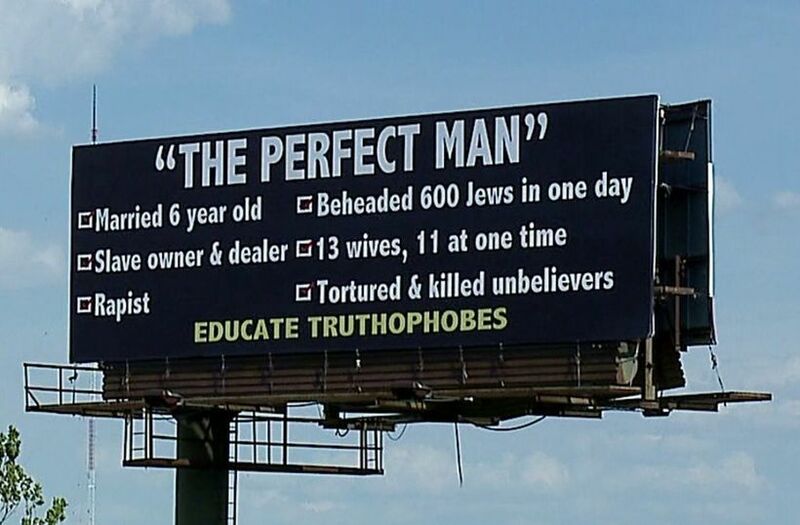 The despicable “Perfect Man” bill boards are appearing everywhere now, and like all humans, Muslims will respond differently to it. They are not a monolithic group and are as diverse as God’s creation. However, they have a choice to aggravate the conflict further or follow Jesus Christ and Prophet Muhammad’s formula of conflict mitigation and goodwill nurturence. After all that is what the higher goal of Islam, Christianity or any faith is – restoring justice, goodwill, harmony and peace on earth. What did Jesus do when he was persecuted and placed on the cross? He said, “Forgive them Lord, for they know not.” What did Muhammad (pbuh) do when the miscreants pelted stones on him during his visit to Taif? He was bleeding and was hurt, but not only forgave, but prayed for them, for they knew not. Most Muslims will follow the guidance and pray for the well being of screwed up men and women. A few will struggle in forgiving them, and a handful of them will hold grudges and animosity towards the men and women who have placed those nasty bill boards? Those handful of Muslims who are angry are as bad as the handful of Christians who violated the message of love that Jesus preached, unless they are not Christians. You cannot go wrong following the Guidance from Jesus and Muhammad. Jesus asked people to “follow him” and Muhammad asked people to follow a coherent system called Islam. A majority of people in all faiths believe in the beauty of their faith; however a few in each group don’t get that right and abuse it to their advantage in making enemies out of those who differ. If Muslims claim to be followers of the man who was called “mercy to mankind” shouldn’t they think, act and talk like him? Similarly, shouldn’t the followers of Jesus really follow him? It is a game to a handful of miscreants to irritate Muslims for no good reason, and I am sure many will be easily angered, forgetting how they should behave. Muslims are to be a mercy to mankind, and no one should fear a Muslim. Everyone should feel safe around a Muslim and Muslims are to be a just, kind and a merciful people. If Muslims play their part and act like a Muslim that Prophet Muhammad taught, no one will be messing with them nor will they get irritates, instead they will pray for them. There is one value that Americans value the most: Freedom of speech. It is an alien idea in most parts of the world, you have to be an American (born or naturalized) to understand this phenomenon. This is what defines us – we are fiercely free and freedom fanatics, after all we live in the land of the free and the brave. We all need to work on integrating our values on freedom, and then all of us will be on the same page. Finally, as a Muslim, I do not condemn the nasty bill boards, but I forgive them, for they know not and I urge Muslims to pray for them in the steps of Jesus and Muhammad (pbut). Let’s be the blessed peacemakers. Once we understand freedom, a core American value, respect and live it, some of the conflicts will go away. You might enjoy this humorous satirical short video about liberty.